With the Legends 3 Heroine Contest now over, many have expressed their hope that the designs that didn’t win would still make appearances in the game in some manner. To them I say, there is hope! Some unused main character designs have made their way into the games for minor roles in the past. Characters like Miss Nurse, the long-lost fifth member of MegaMan’s team! Who, you say? Read on! Lesson 1: The Miss Nurse Report!! Rock and his pals were almost joined by one more!? Drafts for the considered character of Miss Nurse!! She appears in Lakeside Park!? She was even included on this proportion chart! When I think about all the dangers of being a Digger, I’d have to say it makes a lot of sense to have a reliable medical practitioner on board. Of course, for game play, it’s much more streamlined just to go to Data for all your healing needs. 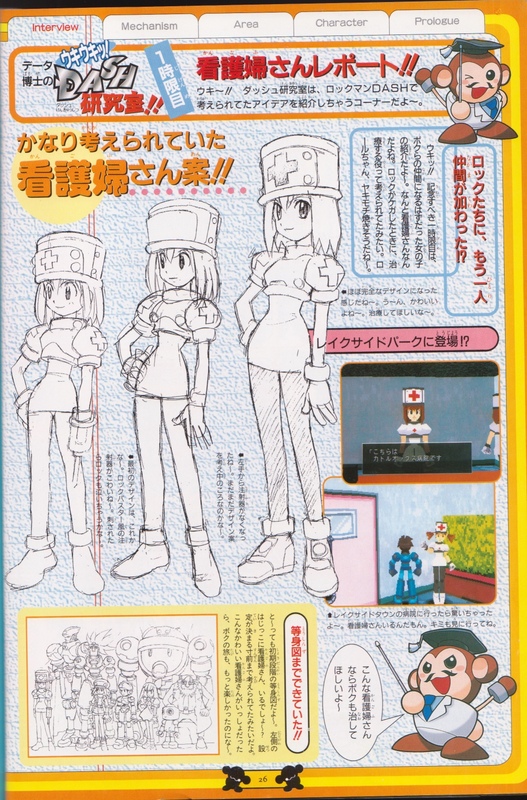 In addition to treating MegaMan’s injuries, Miss Nurse would probably have also been an assistant to Barrel, attending to his health and stopping him from joining in reckless adventures that are beyond someone of his age. We’ll see her popping up a little more in other profiles later on, giving more clues on the role she was to play in the group. 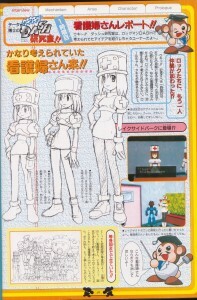 You’ll notice that on that size chart, they’re using the early version of Miss Nurse with the syringe arm, and similarly early character designs for Roll and Tron. And between Teisel and Miss Nurse… who is that imposing caped figure? That’ll be the subject of another of Dr. Data’s lessons. By the way, where is Data on that chart? 9 Comments to "Helloooooo Nurse!" Im hoping at the very least, the runner ups will become NPC’s around town. By the way #20, I dont think you mentioned which of the designs for the L3 heroine you supported. @Model Q: There’s another character with a unique NPC design you’ve probably spotted from Legends 1, and he was also considered for a larger role. I don’t have art of him unfortunately, but I’ll bet you can guess who I mean! @Flame: I voted for a different girl in the US side and the Japanese side, and neither one won. [>_<] But I'm actually satisfied with the final Sephira design so far. What will really bring her to life for me is to see her in motion and put a voice to her face, so I'm looking forward to that. Yeah but which ones? (unless you deliberately prefer to not say) Im just curious. I voted for Higurashi’s design, but in the end, ended up supporting Sensei’s design right alongside it. @#20 Hah. I see what you did there. That’s awesome. I always wondered about that guy. I knew he was something special. I would’ve loved to see him in a larger role. Oh yeah! I voted for Hideki’s and Sensei’s. Hey, thank you for the Animaniacs reference! Happy Katanakka, one and all!